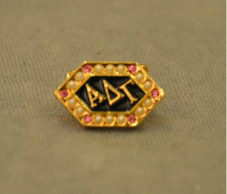 The official Alpha Delta Gamma pin is composed of pure gold, the metal that has always been regarded by the ancients as “King of Metals.” The six rubies represent the six elected national officers whom we consider the lights of greatest brilliance. The fourteen pearls represent the band of men who formed Alpha Delta Gamma Fraternity on October 10, 1924, at Loyola University in Chicago, Illinois. The six pointed shape of the pin represents the six major precepts of the Fraternity. They are, reading counter clockwise from the right lateral apex: friendship, virtue, valor, freedom, ambition and integrity.